Golf has been in the news recently because it has been proposed that the government take back the land that the Hong Kong Golf Club (The Club) sits on to develop housing. It is argued that it would be preferable to eliminate the golf course rather than relocate villages and destroy farmland. In order to ascertain the validity of this assertion, we should examine the costs versus the benefits of golf. In a recent SCMP article, a representative of The Club justified its existence on the basis that Hong Kong is an international business centre and golf plays a big role in business (lots of business gets done on a golf course). As a professional starting out in my career, I remember how golf was a constant topic of conversation around the office. Many of my bosses were avid golfers and corporate events were often golf trips followed by BBQ dinners. So yes, I do believe there is a connection between golf and business. It might be a stretch however to call it an important one. There has been no research that links golf to economic development (as there is with education, infrastructure and the rule of law). If there were, Scotland and Thailand would be business superpowers today. William Chung Pui-lam, president of the Hong Kong Golf Association, said growth of the game – recently made an Olympic sport – would suffer if the Hong Kong Golf Club’s three-course, 170-hectare facility at Fanling were lost to housing. Bobsledding is an Olympic sport, and its development is also suffering due to lack of venues in Hong Kong. Perhaps we should also dedicate public resources to its development? Another housing adviser, Lau Ping-cheung, said the land use of golf courses should be reviewed together with all other private recreational clubs. “But we need to discuss and understand the possible social impact, because Hong Kong is an open city with lots of rich people and foreigners who might be interested in golf.” Rich people also like private jets, perhaps we should subsidize runways for private jets as well? Golf commentator Dominique Boulet, a former Hong Kong representative and a member of the club for almost 30 years, said: “If we lost the Hong Kong Golf Club, I’m not sure I would live here any more.” I never realized how much I would miss Mr. Boulet until he threatened to leave. In fact, I had never heard of him before he made this statement to the SCMP. NY States Attorney General’s office published a report entitled Toxic Fairways. The report, which was particularly concerned with the potential for groundwater contamination, concluded that these [NY] golf courses applied about 50,000 pounds of pesticides in one year, or four to seven times the average amount of pesticides used in agriculture, on a pound per acre basis. Pesticide and fertilizer runoff contaminates ground water, poisoning both humans and wildlife. It is quite ironic, the number of golf charity events held to raise money for cancer research when there is evidence of major excesses of non-Hodgkin’s lymphoma, brain, colorectal and prostate cancers in golf course maintenance workers and superintendents exposed to high concentrations of carcinogenic herbicides and fungicides. The cost of cancer treatment for golf course workers will undoubtedly be borne by the taxpayer funded public healthcare system. Water (and soil) are mankind’s most valuable resources, even if often they are not treated as such. 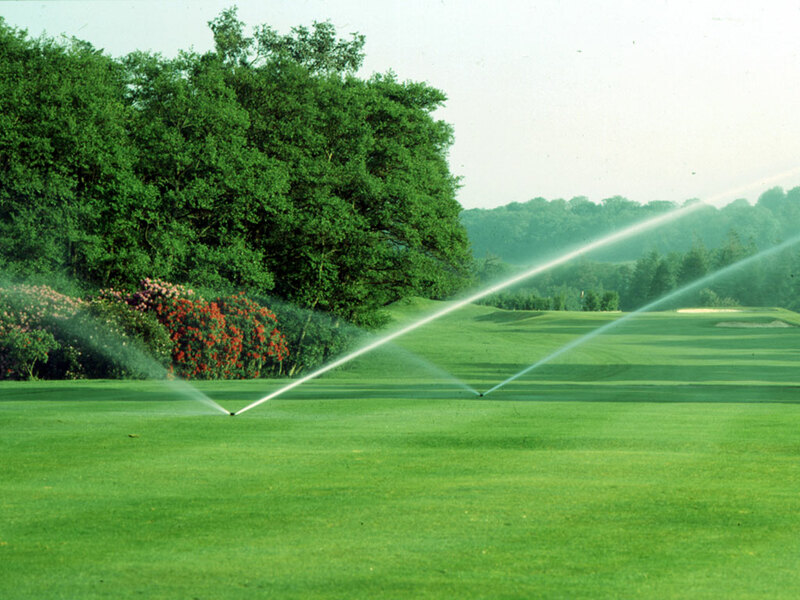 Audubon International estimates that the average American course uses 312,000 gallons per day. Or put another way the amount of water used to irrigate the world’s golf course, 2.5 billion gallons, is sufficient to support 4.7 billion people at the UN daily minimum. In fact, Some 1.1 billion people in developing countries have inadequate access to water, and 2.6 billion lack basic sanitation. The water used to irrigate the golf course is pumped using high pressure pumps that consume lots of electricity, further contributing to climate change. A grass monoculture eliminates habitat and food for native insects, animals and birds. Trees are chopped down and native plants removed to plant non-native grasses. You won’t find frogs, fireflies, dragonflies, butterflies, snails, birds or any other natural life forms on a golf course. The ecological value of the environment has been systematically destroyed to create a simulacrum of the Scottish landscape. The Hong Kong Golf Club occupies 170 hectares (1 hectare equals 107,639 square feet) and has three 18 hole courses. When fully occupied with 4 players on every hole, it can accommodate a maximum 216 players. This means that each player uses 84,715 square feet. An international size soccer field, by comparison, occupies about 86,400 square feet and 22 players are on the field during a match. This means that golf uses almost 22 times more space per person than the sport requiring the second largest amount of space. Unlike other government subsidized sports facilities (the nominal rent is an implicit subsidy), The Club is only open to those that can afford millions for a membership and are friends of Mr. Boulet or Mr. Chung or other current members. Most sports are meritocratic and serve to foster understanding and interaction between different segments of society. Golf on the other hand serves to exacerbate the inequality that is already rife within Hong Kong society. We leave it to you, dear reader, to weight the cost and benefits and arrive at your own conclusion. I grew up near public estates and later moved to a district with only private apartments in hk. I never knew what’s it like to be living in the low income community. But today I got some idea after working at a shopping mall of the largest public estates Kwai Shing/Kwai Hing. It’s not up to a point I was having cultural shock, but both me and my colleagues (who live in other public estates) thought the community was just a little too strange. It’s got a little ghetto feeling if you asked me. Plenty of passer-by have tattoos on them which usually symbolizes gang members. Sorry for the generalization but 9 out of 10 folks would agree when they see what I see. What I was trying to imply here is that, continue unbalancing a society by isolating similar background/income households in close approximation can further unbalance the overall society. In other words, bad gets worser. It further widens the gap between the rich and the poor. I’m not an architect or artist. I’m merely a picky person who observe a lot. I found the design of public estates are either in form A, B or C. I would not complain if they’re appealing. I just don’t get why they have to built in the same way. If you look at an estate in the New Territorities, you’d see the same one in Kowloon, in Hong Kong Island. Why can’t there be better designs. Perhaps bringing more happy colors would also help? Why don’t the low income people deserve a better living environment, a better neighborhood? The higher the population the higher the chance to breed the new elites? Brings more opportunities? We’re facing a saturation in the society by relying on the same economic model. The more the people we have now, the more people will stuck and misallocate their skill sets. In order to look forward, we need to see how many passengers are actually behind on the freight train. Sorry for my average english. I just almost never have chance to use it. I hope I got my message across. Golf is not a sport – it is a game. A game for folks who would actually like to be able to hit a moving object/ball [e.g. tennis, badminton ..etc] but they can no longer do so [for whatever reasons]. So, they hit a stationary one instead – hence golf suits them. I’ve been on many golf courses around the world and they are all artificial playgrounds for folks who claim a round of golf as exercise [oh please]. I am 50 years old and I am absolutely sure that I can out run the world’s top 10 golf professionals [literally by a mile even if they run as a relay]. Just ignore golfers and anything to do with its “status” stuff. Who has a “golf” shirt with a little emblem they wear on “special” occasions to impress? Start by changing the perception of golf and it will not be a want-to-be-in business culture any more. When you see golf on TV, change channels – there must be something on that is better than focusing on a white dot moving across a blue or green background. Professional golfers only exist to sell products – you know the ones I’m talking about, the ones you’ve been lusting for all these years. Ignore their advertising, don’t buy the stuff and you’ll see what golf will become. It is not a cost-benefit analysis. It just lists out some pros and cons of Golf Course. And some pros and cons are comparative, for example, if the whole site were replaced by high rise buildings, the biodiversity value of gold course definitely will be higher than high rise! Yet another amazing article. Who could ever think these statistics exist! I hope your government reaches the right decision and that there may be some lobbyists to help. So much waste on this planet that the common folk is anaware of.Thank you for such eye- opening information. Next Next post: Technology is the Answer…or is it?